Now then young man, I've just perused your tandem piccies and I am mighty impressed by how straight and aligned the top tubes and seat tubes are. This is most unlike you. Did you have help? I hope that you intend to brace that big open hole where the direct lateral tube isn't. 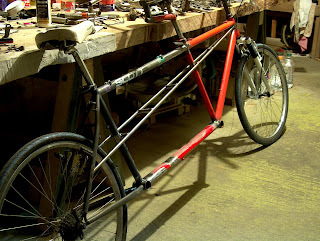 The Direct Lateral Design is the best tandem design; you know this is true because my tandem is one and everything bike that I own is the best. Also I strongly recommend keeping the drive all on the right hand side if possible, otherwise you need to venture into tandem chainsets which may look like normal chainsets except that of the four cranks, three are reverse pedal threaded to normal. Both fronts and the left rear. Tandem chainsets are expensive. However a triple or quad rear chainset and a sync chain on the right will work well. Sacrifice high gears for low ones. You need low gears, lots of them. You will be slower on a tandem, best get this out in the open at the start. Lots of people buy a tandem and think they will be really fast, twice the output, same frontal area and all that. Unfortunately, it doesn't work out like that, tandems tend to average your separate speeds. If you are faster than Heidi, then she will go a bit quicker than normal and you will go slower than normal. Uphill you will be slower, much slower. Downhill you will be much much faster. And on the flat you will be about the same or maybe a bit quicker. I have lots of tips for riding tandems; we will discuss them shortly at great length. 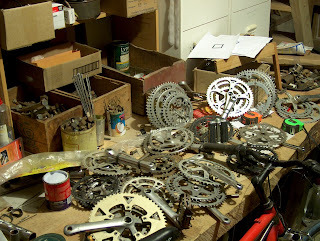 After you have examined my Campagnolo toolkit. Anyway Mr Knight is almost unkind in implying criticism of my brilliant welding and alignment and whatnot, and the only reason he isn't entirely unkind is because it is a factual remark. My welding is crap and so is my alignment, usually. And no I didn't get any help and the way it came out right was this: Pure Luck. The jig to weld was two bits of angle iron clamped very hard to the BB shells, the frames held together with a length of rubber inner tube. And my experience has always been that this is as inadequate as any other method I've ever dreamt up, and I fully expected to have to bend the thing afterwards - erm - that is to say, Cold Set it -and was astonished that this hasn't been necessary. Note, however, that I do not afford this Blog the courtesy of close-ups of the welds. "Hmm, MIG welds aren't very pretty, are they,' is what Mr English observed once when he had spent too long examining one of my machines.